All Crystal Sound Rods are delivery in a customized special carrying box. The woodframe is made from the Ash Tree. 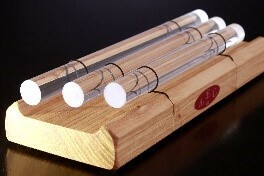 The small, Duo, or Triple Crystal Sound Rods come delivered with ist own wooden Mallet. 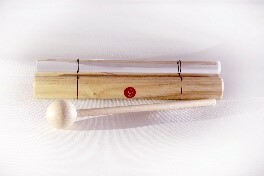 Crystal Sound Rods in „Large“ come delivered with 1 wooden Mallet and 1 rubber Mallet. Alle Crystal Rods werden auf 99,992% reines SIo2 IN DEUTSCHLAND komplett hergestellt.